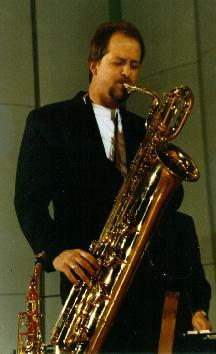 Carl Bender, saxophonist, has been performing in Kansas City for more than 20 years. He even started leading his own group, The Carl Bender’s Cool Breeze Jazz Ensemble. Carl also can currently be found performing with The Kansas City Chief’s TD Pack Band, Fat Finger, Bram Wijnands’ Majestic 7, Mike Smith and Friends, and The Midtown Quartet. He has performed in the past with Mary Wilson of the Supremes, Martha Reeves and the Vandellas, The Temptations, The Bob Newhart Show when Bob Newhart is in Kansas City, Lenny Klinger’s Galaxy, David Basse and City Light Orchestra, Pat Morrissey and the Shake House Horns, and Tim Whitmer and KC Express. Carl has done events such as performing for the North American premier of the movie by Robert Altman, “Kansas City”. Carl has been influenced by many Jazz Greats including, John Coltrane, Michael Brecker, Phil Woods. And also by many other icons from various stylistic backgrounds such as Tito Puente, to Jimmy Hendrix.